Over the past year, collectors have been buzzing over Topps Chrome Baseball's AUTOGRAPHED ROOKIE CARDS. And 2005 TOPPS CHROME SERIES 2 does not disappoint. Each $30 mini box (2 mini boxes per master box) guarantees 1 Autographed Rookie Card. 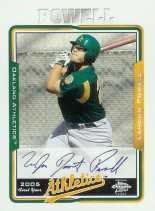 The 18-card Autographed Rookie Card subject list features some of the most exciting prospects in the game. Here are a few notables. 2005 Topps Chrome Baseball Series 2 ships May 9th and carries a $60 SRP for each Master Box. Each Master Box includes 2 Mini Boxes (featured in Topps Chrome for the first time).